Maximilian, Margrave of Baden (Maximilian Alexander Friedrich Wilhelm; 10 July 1867 – 6 November 1929), also known as Max von Baden, was a German prince and politician. He was heir presumptive to the grand ducal throne of Baden, and in October and November 1918 briefly served as Chancellor of the German Empire. He sued for peace on Germany's behalf at the end of World War I based on U.S. President Woodrow Wilson's Fourteen Points, which included immediately transforming the government into a parliamentary system, by handing over the title of Chancellor to SPD Chairman Friedrich Ebert and unilaterally proclaiming the abdication of Emperor Wilhelm II. Both events took place on 9 November 1918, the beginning of the Weimar Republic. 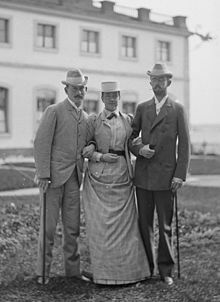 Prince Maximilian (left) with his cousin Victoria of Baden and her husband Crown Prince Gustaf of Sweden (later king Gustaf V), Tullgarn Palace, about 1890. Born in Baden-Baden on 10 July 1867, Maximilian was a member of the House of Baden, the son of Prince Wilhelm Max (1829–1897), third son of Grand Duke Leopold (1790–1852) and Princess Maria Maximilianovna of Leuchtenberg (1841–1914), a granddaughter of Eugène de Beauharnais. He was named after his maternal grandfather, Maximilian de Beauharnais, and bore a resemblance to his cousin, Emperor Napoleon III. Max received a humanistic education at a Gymnasium secondary school and studied law and cameralism at the Leipzig University. In 1900, he married Princess Marie Louise of Hanover (1879–1948) at Gmunden. Upon the order of Queen Victoria, Prince Max was brought to Darmstadt in the Grand Duchy of Hesse and by Rhine as a suitor for Victoria's granddaughter, Alix of Hesse-Darmstadt. Alix was the daughter of Victoria's late daughter, Princess Alice, and Louis IV, Grand Duke of Hesse. Alix quickly rejected Prince Max, as she was in love with Nicholas II, the future Tsar of Russia. After finishing his studies, he trained as an officer of the Prussian Army. 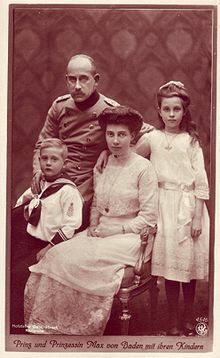 Following the death of his uncle Grand Duke Frederick I of Baden in 1907, he became heir to the grand-ducal throne of his cousin Frederick II, whose marriage remained childless. He also became president of the Erste Badische Kammer (the upper house of the parliament of Baden). In 1911, Max applied for a military discharge with the rank of a Generalmajor (Major general). Upon the outbreak of World War I in 1914, he served as a general staff officer at the XIV Corps of the German Army as the representative of the Grand Duke (XIV Corps included the troops from Baden). Shortly afterwards, however, he retired from his position (General der Kavallerie à la suite) as he was dissatisfied with his role in the military and was suffering from ill health. In October 1914, he became honorary president of the Baden section of the German Red Cross, thus beginning his work for prisoners-of-war inside and outside Germany in which he made use of his family connections to the Russian and Swedish courts as well as his connections to Switzerland. In 1916, he became honorary president of the German-American support union for prisoners of war within the YMCA world alliance. Due to his liberal stance he came into conflict with the policies of the Oberste Heeresleitung (OHL - Supreme Army Command) supreme command under Paul von Hindenburg and Erich Ludendorff. He openly spoke against the resumption of the unrestricted submarine warfare in 1917, which provoked the declaration of war by the United States Congress on 6 April. His activity in the interests of prisoners of war, as well as his tolerant, easy-going character gave him a reputation as an urbane personality who kept his distance from the extremes of nationalism and official war enthusiasm in evidence elsewhere at the time. Since he was almost unknown to the public, it was mainly due to Kurt Hahn, who served since spring 1917 in the military office of the Foreign Ministry, that he was later considered for the position of chancellor. Hahn maintained close links with Secretary of State Wilhelm Solf and several Reichstag deputies like Eduard David (SPD) and Conrad Haußmann [de] (FVP). David pushed for Max to be appointed Chancellor in July 1917, after the fall of Chancellor Bethmann-Hollweg. Max then put himself forward for the position in early September 1918, pointing out his links to the social democrats, but Emperor Wilhelm II turned him down. After the Oberste Heeresleitung told the government in late September 1918 that the German front was about to collapse and asked for immediate negotiation of an armistice, the cabinet of Chancellor Georg von Hertling resigned on 30 September 1918. Hertling, after consulting Vice-Chancellor Friedrich von Payer (FVP), suggested Prince Max of Baden as his successor to the Emperor. 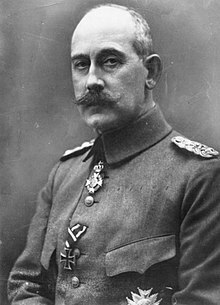 However, it took the additional support of Haußmann, Oberst Hans von Haeften [de] (the liaison between OHL and Foreign Office) and Ludendorff himself, to have Wilhelm II appoint Max as Chancellor of Germany and Minister President of Prussia. While trying to move towards an armistice, Max von Baden, advised closely by Hahn (who also wrote his speeches), Haußmann and Walter Simons, worked with the representatives of the majority parties in his cabinet (Scheidemann and Bauer for the SPD, Matthias Erzberger, Karl Trimborn [de] and Adolf Gröber [de] for the Centre Party, von Payer and, after 14 October, Haußmann for the FVP). Although some of the initiatives were a result of the notes sent by Wilson, they were also in line with the parties' manifestoes: making the Chancellor, his government and the Prussian Minister of War answerable to parliament (Reichstag and Preußischer Landtag), introducing a more democratic voting system in the place of the Dreiklassenwahlrecht (Three-class franchise) in Prussia, the replacement of the Governor of Alsace-Lorraine with the Mayor of Straßburg, appointing a local deputy from the Centre Party as Secretary of State for Alsace-Lorraine and some other adjustments in government personnel. Pushed by the social democrats, the government passed a widespread amnesty, under which political prisoners like Karl Liebknecht were released. 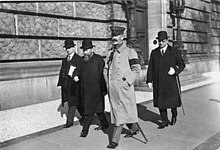 Under Max von Baden, the bureaucracy, military and political leadership of the old Reich began a cooperation with the leaders of the majority parties and with the individual States of the Reich. This cooperation would have a significant impact on later events during the revolution. In late October, the Imperial constitution was changed, turning the German Empire into a parliamentary system. However, Wilson's third note seemed to imply that negotiations of an armistice would be dependent on the abdication of Wilhelm II. The government of Chancellor Max von Baden now feared that a military collapse and a socialist revolution at home were becoming likelier with every day that went by. In fact, the government's efforts to secure an armistice were interrupted by the Kiel mutiny which began with events at Wilhelmshaven on 30 October and the outbreak of revolution in Germany in early November. On 1 November, Max wrote to all the ruling Princes of Germany, asking them whether they would approve of an abdication by the Emperor. On 6 November, the Chancellor sent Erzberger to conduct the negotiations with the Allies. Maximilian, seriously ill with Spanish influenza, urged Wilhelm II to abdicate. The Emperor, who had fled from revolutionary Berlin to the Spa headquarters of the OHL, despite similar advice by Hindenburg and Ludendorff's successor Wilhelm Groener of the OHL, was willing to consider abdication only as Emperor, not as King of Prussia. Although events had overtaken him during his tenure at the Reichskanzlei and he was not considered a strong Chancellor, Max is seen today as having played a vital role in enabling the transition from the old regime to a democratic government based on the majority parties and the Reichstag. This made the government of Ebert that emerged from the November revolution acceptable to some conservative forces in the bureaucracy and military, which was one of Ebert's strongest aims. They were thus willing to ally themselves with him against the more radical demands by the revolutionaries on the far-left. Maximilian spent the rest of his life in retirement. He rejected a mandate to the 1919 Weimar National Assembly, offered to him by the German Democratic politician Max Weber. In 1920, together with Kurt Hahn, he established the Schule Schloss Salem boarding school, which was intended to help educate a new German intellectual elite. Max also published a number of books, assisted by Hahn: Völkerbund und Rechtsfriede (1919), Die moralische Offensive (1921) and Erinnerungen und Dokumente (1927). In 1928, following the death of Grand Duke Frederick II, who had been deposed in November 1918 when the German monarchies were abolished, Maximilian became head of the House of Zähringen, assuming the dynasty's historical title of Margrave of Baden. He died at Salem on 6 November the following year. Princess Marie Alexandra of Baden (1 August 1902 – 29 January 1944); married Prince Wolfgang of Hesse, Landgrave of Hesse-Kassel, son of Prince Frederick Charles of Hesse-Kassel, designated King of Finland, and Princess Margaret of Prussia; no issue. Marie Alexandra was killed in a bombing of Frankfurt by the Allies of World War II. Prince Berthold of Baden (24 February 1906 – 27 October 1963); later Margrave of Baden; married Princess Theodora, daughter of Prince Andrew of Greece and Denmark and Princess Alice of Battenberg. Theodora was the sister of Prince Philip, Duke of Edinburgh. ^ a b c d e Almanach de Gotha. Haus Baden (Maison de Bade). Justus Perthes, Gotha, 1944, p. 18, (French). ^ a b c d e f g h i j k l "Biografie Prinz Max von Baden (German)". Bayerische Staatsbibliothek. Retrieved 22 July 2013. ^ a b c d e f g h i j Haffner, Sebastian (2002). Die deutsche Revolution 1918/19 (German). Kindler. ISBN 3-463-40423-0. ^ Wilhelm II (1922). The Kaiser's Memoirs. Translated by Thomas R. Ybarra. Harper & Brothers Publishers. pp. 285–91. ^ a b Rangliste der Königlich Preußischen Armee und des XIII. (Königlich Württembergischen) Armeekorps für 1914. Hrsg. : Kriegsministerium. Ernst Siegfried Mittler & Sohn. Berlin 1914. S. 355. ^ a b Hof- und Staatshandbuch des Königreichs Württemberg 1907. S. 30. ^ a b Lothar Machtan: Prinz Max von Baden: Der letzte Kanzler des Kaisers. Suhrkamp Verlag. Berlin 2013. ISBN 978-3-518-42407-0. S. 246. This page is based on the Wikipedia article Prince Maximilian of Baden; it is used under the Creative Commons Attribution-ShareAlike 3.0 Unported License (CC-BY-SA). You may redistribute it, verbatim or modified, providing that you comply with the terms of the CC-BY-SA.